In spring 2019 I’ll be based at the European University Institute in Florence, Italy, as a visiting fellow (postdoc). I’m still working as part of the Centre for Sociology of Democracy at Tampere University, and my ongoing research deals with populism, polarization and deliberation in online public spheres. I’m now a postdoctoral researcher at the University of Tampere, based in Helsinki with the Citizens in the Making research group. I still mostly work on political debates online, particularly populist argumentation. I regularly visit Florence, Italy; particularly the European University Institute and the COSMOS Centre on Social Movements Studies. Also, a version of that paper was just published in Politiikka (PDF, in Finnish). In the works: a chapter on the Finns Party and social media for a book that’s coming out in English, on the Finns Party, on ECPR Press. Also, we’re working on an article on how right-wing populist alternative online media in Finland talk about immigration, how their vocabulary differs from that of mainstream media, and how politicians adopt their vocabulary. Future plans: I’m working on a funding application about political polarization. Let’s see how that pans out. This is the lecture I gave at the public defense of my PhD on 6 Oct 2017 at the University of Helsinki, with Dr. Benjamin Moffitt acting as opponent and Prof. Matti Kortteinen as custos. About two weeks ago, on the 26th of September, the press release of my PhD went out, and was published more or less verbatim by some news media. Also, a well-known Finnish countermedia website, MV-lehti, or ‘WTF News’, as I translate it, published a story about my PhD. It cited about half of the press release, but only those parts that could be interpreted as positive for WTF News. I had said in the press release that contrary to some accounts, WTF does in fact quite often emphasize factual arguments and research-based knowledge in its content. In their texts, they often voice a strong belief about siding with the facts, against biased information. To them, the mainstream media is ‘fake news’. However, I also noted that WTF cherry-picks and publishes only the kind of factual information that supports its right-wing populist agenda, and omits other information. Of course, in this case as well, they did just that – they presented my research as supporting the veracity and trustworthiness of their reporting, leaving out any inconvenient details like my criticism towards their publication bias. I couldn’t have hoped for a better demonstration of my argument. WTF is a medium which is based on the foundational idea that the general public, the people, are being led astray by the claimed multiculturalist, liberal, left-wing bias of the mainstream media elite. A populist idea. This highlights the main thesis of my work: that populism is a cultural toolkit that is used not just by parties and politicians, but citizens, to both make sense of the world and do politics. But populism is, still, a moving target. The fact that politicians and citizens use it does not mean they agree on what it means. Social scientists agree on it perhaps even less. How, then, one may ask; even why, should one study populism? First, let me address the question of ‘how’. Sociology, to me, is an empirical social science, which should be based in observations about social action. Social action, because that is something we can directly observe – in political conversations, campaigning, or just everyday debates – as opposed to internal states of individuals, such as values or ideologies, which are not directly observable, and about which we can only see traces in social action. Of course, observing populism ‘in action’, as I claim to do, demands a definition of what populism is. And there are many available definitions – both by scholars and by political actors themselves. Bruno Latour has claimed that sociologists should ‘follow the actors themselves’ rather than imposing our own concepts and categories on them. But in this case, the populism of ‘the actors’ and the populism of ‘the scholars’ has long ago been cross-bred. Many populist politicians have been very aware of, and influenced by, theories of populism. As an example, Timo Soini, the chairman of the Finns Party for two decades, completed his Master’s degree in this very university, on the very topic of populism, before becoming a successful populist entrepreneur. This, of course, is the case with other political ideologies as well. A distinction cannot be made between the understanding of the scholar, and the understanding of ‘the actors themselves’. In fact, looking at the most recent works on populism, most scholars now agree on a minimal definition of populism: it is politics that posits a positively connoted people against a negatively connoted elite, and sees this fundamental opposition as central to understanding society. But they disagree on whether this opposition, this dichotomy, describes an ideology, a style, a discourse, or something else. What defines which one of these categories populism represents is more often determined by the researcher’s preferred school of thought, I argue, rather than any empirical examination of populism. Theorists of discourse see discourses, scholars of ideology see ideologies, and pragmatists see habits, or practices. To me, the usefulness of a concept should be evaluated on the basis of its usefulness for empirical work, and its usefulness for cooperation. These are my grounds for framing my work through the concept of the populist toolkit. The ‘toolkit’ metaphor comes from Ann Swidler’s 1986 article ‘Culture in Action’. In it, Swidler argues that we should understand culture “as a ‘tool kit’ of symbols, stories, rituals, and world-views, which people may use in varying configurations to solve different kinds of problems”. This, I feel, is quite an elegant way of avoiding the typical pitfall of cultural explanations in sociology, namely, cultural determinism: ‘these people act the way they do, because it’s in their culture to do so’. Which is not really an explanation at all. Looking at culture as habits, practices and repertoires of action gives weight to the free will of the individual, avoiding cultural determinism; but does take culture seriously, in the sense that it does constrain, as well as enable, action. What this means with regards to populism, then, is that the opposition of the people and the elite provides politicians and citizens a way of making sense of things. In a fast-changing, uncertain and complex world, people need cognitive tools to orient themselves to situations. Populism is such a tool. And several things result from the belief that the social world is constituted as a battle between the ‘pure people’ and the ‘corrupt elite’. For example, the elite are often described in populism as technical, while the people are moral. The people don’t have to justify their beliefs by rationalizations – like the elite – instead, the people feel what is right. The elite are bureaucrats and technocrats, while the people, and their general will, are the true sovereign. The top illustration on the cover of the book demonstrates this central moral narrative of populism. It is a woodcut from a volume published in the year 1555, by the title of Historia de Gentibus Septentrionalibus, or “A History of Northern Peoples”, by Swedish archbishop Olaus Magnus. It was one of the first broadly circulated printed sources describing Scandinavian peoples and their customs. The woodcut printed here describes “A crowd of peasants … attacking the castle of a cruel bailiff.” The people are taking power back from the elite. Now that I have said something about populism and how to study it, I will move on to the question of ‘why’. Why populism? This question has to do with populism’s relationship with other concepts. The one it is most often confused with is nationalism. This is not a dissertation about nationalism. Of course, it contains research about actors that are nationalist, but the primary focus is not on their nationalism. It is on how they use the toolkit of populism. Why is that? I strongly believe that in research, people cannot and should not be simply labelled populists, nationalists, racists or right-wing radicals; and then expected to act according to that label, any more than they should be labelled leftists or liberals, and then expected to act as such. People don’t act consistently according to labels ascribed to them. Too many studies are fixated with labels. Should we consider Geert Wilders, Marine Le Pen, or Jussi Halla-aho, populists? Or right-wing radicals? Or racists? They all employ populist rhetoric, as well as right-wing and racist rhetoric. But no person, and no politician, fully corresponds to any single label you give them, no matter how specific the label. At least not for very long. And the more specific the label, the less useful it is as a label. Instead, we should recognize that the same people can act in ways that are nationalist, populist, conservative, liberal, or something else. Describing kinds of action is more fruitful than categorizing groups of people. My point is not that we shouldn’t point out racism as ‘racism’, when we see it. My point is that there is more to what we call right-wing populism than just racism. For example, populism. And populism is also used by movements that are not right-wing, or nationalist. If we analyse right-wing populism only as nationalism, we miss a large part of it. Of course, that is also the case if we only employ the vocabulary of populism. But I claim in my work that populism itself is still an understudied phenomenon, because so much of the voluminous research on it conflates it with nationalism. As shown by the recent rise of non-right-wing populist movements and parties, such as Syriza, Podemos, M5S, the Pirate Parties, Bernie Sanders and Jeremby Corbyn, populism without the right-wing component is quite possible. We are living in times of populism, not just right-wing populism. In Finnish politics, nationalism and populism have had a symbiotic relationship in the past decade. But this doesn’t mean they are the same thing. When we look at populism in action, as I have proposed, we can see that the political actors pushing nationalist agendas use populist tools, but so do other political actors. This is an analysis that is not possible if we do not separate populism and nationalism analytically, as things that may, or may not, co-exist empirically. Now I can explain the second cover illustration of the book. In it, “Laps in the Finnmark are defending themselves against seafarers they believe are pirates.” They are excluding Others, foreigners, from their community. I claim that such exclusion often goes with populism, but is not a necessary component of it. I have now given some answers to the questions of ‘how’ and ‘why’ study populism. But I also claimed that sociology should be primarily an empirical social science. So, I will now present my four empirical articles. The first one (PDF) deals with populism and crisis. It is often claimed that populism is a reaction to crisis, or at least to a sense of crisis. But recently, some scholars have begun to understand that rather than a simple causal relationship, our understanding of how crisis may lead to populism needs to have room for populist agency. This is what we do in Article I. Our research question is whether the economic crisis of 2009 onward affected the rise of populism in Finland. Our answer is yes, but: it was not a direct, causal, structural effect. Such an effect would be, for example, economic crisis creating unemployment, which creates resentment, which creates support for populism. But after looking at economic indicators, media studies, and the discursive output of the Finns Party; we show that despite a slump in economic growth, no significant increase in unemployment, or cuts in benefits, or public services, took place as result of the crisis before the 2011 elections. What did happen, was that the EU was more or less forced to accept bailouts for Portuguese and Greek banks. These provided the Finns Party with a discursive opportunity to present themselves as representatives of the hardworking Finnish people, opposed to elite EU bureaucrats and the so-called ‘lazy Greeks’. The agency of the party, employing populist argumentation, was crucial for their success, we argue. The second article (PDF) deals with the Finns Party and gender. Right-wing populist parties are in general male-dominated, and that is the case also in Finland. Looking at this more closely, we notice in the Finns Party a gender gap, and a gendered discourse. Firstly, Finns Party women differ from the men of the party in their opinions, and justifications for those opinions. Female Finns Party candidates, in 2011, advocated such left-wing and liberal positions as poverty relief, and equal rights for sexual minorities, significantly more often than men. Both male and female candidates did oppose immigration, but men were more right-wing in economic issues, justifying free-market policies by referring to the stimulating effects of economic competition. In terms of discourse, Finns Party women tended to emphasize a traditional caring womanhood. Rather than identifying as feminists, like other parties’ women’s organizations, the Finns Party women defended their right to stay at home taking care of family. The third article (PDF) is about populism and feelings. It is often noted that populism uses emotional argumentation. I look at this more closely in the debate over Suvivirsi, the traditional spring hymn in schools. The article presents a theory of how populism can appropriate familiar emotional experiences for political causes. Taking a pre-existing emotional experience, such as singing a hymn, and justifying political arguments on that familiar emotion, infuses the demands with a strong emotional charge, that can only be appreciated by those who share the experience. This makes such appeals to familiarity potentially exclusionary. Finally, the fourth article (forthcoming) is about populism and knowledge. It is often claimed that populists don’t care about the truth, and base their arguments on feelings and identity instead. At the very least, they’re anti-intellectual. Based on an analysis of posts from Hommaforum and WTF News, (or MV-lehti), the argumentation on these forums is not very often anti-intellectual. On the contrary in fact: they very strongly claim to base their arguments on scientifically proven facts, and directly oppose emotions in politics, claiming that they cause bias. But, as I explained in the beginning, they often use scientific knowledge for post-hoc rationalizing of opinions, in a way that is biased to confirm their existing views. What populists have done is politicize – make playable – the axis between populism and technocracy, the people and the elite; and in many cases, an axis between feelings and knowledge. Mainstream political actors now face a choice of either taking up the tools of populism – as they have done in some countries – or to fight populism, by defending liberal democracy, and resisting political polarization. I’m defending my PhD on 6 Oct 2017 at 12 noon in Auditorium XIV of the University of Helsinki Main Building. Benjamin Moffitt (Uppsala University) will act as opponent. Paperback copies available at the event or Unigrafia Bookstore, full PDF available here. Suomalaisten ”tunnelmat” eivät romahtaneet 2012, ja mitä se edes tarkoittaisi? Kirkon tiedotuskeskuksen viestintäpäällikkö Lari Lohikoski esitti Suomen Kuvalehden blogissa 12.2.2016 sisä- ja puolustusministeriöiden tilaaman Suomen mielialaindikaattori -tutkimuksen ”salatun” loppuraportin (PDF) ”ennustaneen vihapuheen nousun jo vuonna 2013”. Kyseessä onkin hämmentävin pitkään aikaan lukemani tutkimus! – Raportin on kirjoittanut tulevaisuudentutkija Leena Ilmola, jonka ohjaaja on matemaatikko John Casti. [Oikaisu 30.5.2016: John Casti ei ole Leena Ilmolan ohjaaja. He ovat vain tehneet yhteistyötä.] Tutkijaryhmän jäsenten nimiä ei kerrota. Ilmola ja Casti ovat perustaneet ”Global X-Network” -tutkijaverkoston, joka yrittää ennustaa ”extreme eventsejä”, lyhyesti ”X-EVENTS”, jotka ovat maailmaajärisyttäviä katastrofeja kuten talouskriisejä tai ydinterrori-iskuja. Tämän verkoston tuote tämäkin tutkimus on. – Castin kirjoituksille tyypillistä on apokalyptinen pelottelu. Castin & Ilmolan sinänsä mielenkiintoinen ja uskalias suuntaus ei juuri keskustele valtavirtayhteiskuntatieteen kanssa, joka suhtautuu aika skeptisesti yhteiskunnallisten tapahtumien ennustamiseen. Ilmolan mukaan yhteiskunnan ennustaminen on kuitenkin ”kuin sään ennustamista” (raportti s. 11) – ei aivan tarkkaa, mutta ”ennuste kertoo, mikä mahdollisista säistä on todennäköisin”. – John Casti on jäänyt vuosina 2002 ja 2004 kiinni laajojen tekstien suorasta plagioinnista. HS kirjoittaa (10.11.) 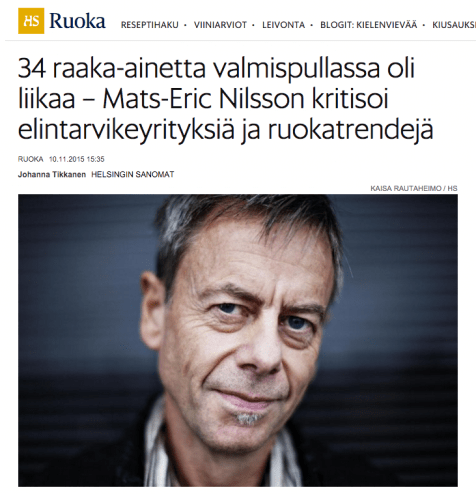 ruokatoimittaja Mats-Eric Nilssonista, joka kritisoi mm. sitä, että elintarvikkeissa on liikaa ainesosia. Juttu on malliesimerkki ruoka-aiheisesta höpöhöpöstä, jossa pelataan mielikuvilla ”puhtaasta” ja ”aidosta” ruoasta ilman, että sanotaan itse asiasta oikeastaan juuri mitään. Katsotaanpa. Ensinnäkin: Ruoan raaka-aineiden määrä ei kerro mausta tai terveellisyydestä mitään. Ne riippuvat ihan siitä, mitä ne raaka-aineet ovat. Raaka-aineiden määrä taas riippuu ihan siitä, miten ”raaka-aine” määritellään, eli miten tarkasti ainesosat listataan. Noin muutenhan jutussa peräänkuulutetaan, että ihmiset tietäisivät, mitä syövät, mikä on tietenkin hyvä tavoite – luulisi siis, että pitkä ainesosalista olisi hyvä asia, koska se on tarkka? Vaikea kyllä sanoa, miksi sitä pidetään jutussa huonona asiana, kun sitä ei mitenkään perustella. ”Miksi valtaosa päiväkodin lapsista osaa leipoa parempia korvapuusteja kuin iso leipomoyritys?” – No siksi, että päiväkotilasten korvapuustit syödään tuoreina, ison leipomoyrityksen korvapuustit viikon päästä, jonka ajan ne seisovat muovipusseissa huoneenlämmössä kaupassa. Siksi myös leipomoyrityksen korvapuusteihin täytyy laittaa erilaisia lisäaineita ja ne täytyy muutenkin valmistaa tietyllä tavalla. Päiväkotilapsen korvapuustit myös menevät aika usein pieleen ja niissä on aika usein esim. päiväkotilapsen räkää. ”Kirja kannustaa ottamaan takaisin osan siitä vallasta, jonka olemme antaneet ruokateollisuudelle.” – Se ”valtahan” on ”annettu” siksi, ettei joka päivä ole pakko viettää tunteja haalien raaka-aineita ja laittaen ruokaa, kun sitä saa myös kaupasta ja ravintolasta halvalla, nopeasti ja turvallisesti. Sitten voi laittaa huolella hyvää ruokaa hyvistä ja yksinkertaisista raaka-aineista silloin kun haluaa. ”Ennen pullotusta viineihin lisätään makua parantavia aineita.” – Eikös se ole hyvä? Itse ainakin pidän enemmän hyvästä kuin huonosta viinistä. ”Nilsson inhoaa monia aikamme ruokailmiöitä. … Hän toivoisi, että pakkomielteinen ruuasta, dieeteistä ja trendeistä kohkaaminen menisi jo ohi.” – Tämä siis ruokajournalistilta, joka valittaa samassa haastettelussa, että ruoasta kirjoitetaan liian vähän?